Motivation, Mindfulness and Power Coaching for your next event. Engage your staff and motivate them with a unique keynote speaker. 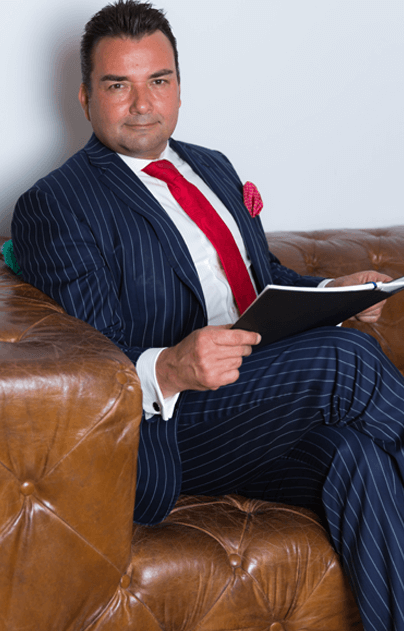 From police officer to successful criminal lawyer, Michael will bring a fascinating and highly entertaining session to your next corporate, sports or social function. Hear the stories, the defeats and incomparable successes of his journey through the criminal justice system to become the owner of one of Australia’s most successful law firms. Michael is a published author having written numerous books, covering topics of true crime, personal development and meditation. Michael has coached thousands of people inside and out of the criminal justice system to use meditation as a tool to transform lives. He is dedicated to exploring the experiences of individual overcoming and resilience with ordinary people. Throughout the years, Michael has written 12 books and not only lives his philosophies, but has been an advocate for the use of meditation in everyday life to reduce stress and enhance well-being. Michael Kuzilny is a multi-award-winning presenter, social commentator, and one of Australia’s best known and highly regarded criminal lawyers. Comfortable in front of large, live audiences and the camera, Michael brings an enlightened, insightful and always captivating perspective on matters of great legal, cultural and social importance. A veteran interviewer and host of nationally televised show, The Platform, Michael’s guests have included some of Australia’s most exciting, enigmatic and controversial identities including world champion boxer Anthony Mundine, AFL star and media personality Sam Newman, and acclaimed actress Nicky Whelan. Whilst at ease presenting probing questions and disarming celebrities on The Platform, Michael displays his versatility, sensitivity and breadth as host of Tough Times, a show dedicated to exploring the experiences of individual overcoming and resilience with ordinary people. Michael’s engaging and authentically down-to-earth style creates an environment of unique comfort for his every-day guests who share their inspiring stories of adversity and triumph. As a former officer in the Victorian and Queensland police forces, Michael confronted some of Australia’s most notorious criminals and was on the scene at events which stunned the nation. Drawing on his experiences in uniform, and out as a renowned criminal defence lawyer, Michael displays a singular wealth of knowledge about the human condition, which he translates creatively and passionately to motivate, encourage and stimulate innovators, business leaders, sports clubs and community organisations to achieve their goals. Australia's most exciting Motivational Speaker. Michael Kuzilny - Exclusive access to the Southern Hemispheres most influential business and mindfulness coach. Michael Kuzilny is the director of MK LAW. Level 8, 350 Collins Street Melbourne, Victoria, AUSTRALIA. www.mklawfirm.com.au In Australia, many know MK as the lawyer of the people, having hosted his own TV shows over the years and helping people through the tough times. Michael Kuzilny is the author of 10 books, and enjoys inspiring audiences around the globe. As an international success coach and speaker he loves to motivate small and large companies, including FORTUNE 500 companies, to achieve increased happiness, productivity and work /life balance. MK strongly believes that a superior attitude makes all the difference in large companies, in families and people's personal lives. Super fantastic attitude - super fantastic outcomes, average attitude - average outcomes, poor attitude - poor outcomes. Michael Kuzilny has been a long standing member and former Governor of Toastmasters International and has been involved with Rotary Clubs, Australia. Michael, who took up meditation 20 years ago, says that spending 20 minutes in silence every day has changed his life in every way possible. Michael says "Western society is crazy; and it's getting crazier". Depression rates and mental health issues are becoming an epidemic. In his favourite book "MEDITATE OR GO CRAZY", Michael speaks about the many psychological and health benefits of regular meditation, and explains in his talks on how simple it is to gain the benefits from this ancient practice. MKLAW. ANTENNA AWARDS NATIONAL - BEST MALE TV PRESENTER. GLOBAL AWARDS - DEFENCE LAWYER OF THE YEAR- AUSTRALIA. In SPLIT SECOND Michael shares his 30 year journey in the Criminal justice system. He authentically reflects on stories of gangs, drugs, police corruption, and how he got through his own tough times. This has to be one of the most real, exciting and authentic true crime books available on the market today. Michael tells it the way it was and how it is now; the good, the bad and the ugly. Author Michael Kuzilny is a successful Australian based lawyer who has been working in the criminal justice system since 1986. He operates his own legal firm called MK LAW. He is a published author of numerous books. enquiries / book orders / or conference bookings.